The Havok Halloween issue has always been a favorite, and this year is no exception. Skeletons, Slashers, and Succubi does not disappoint in its return to classic horror stories, the stories that make the Halloween issue what it is. Award-winning author Steven Jenkins knows what really happened at 17 Richcross Street. Andrew Winch is lost in a cave, from which there may not be a way out. Nicole Tanquary's Little Ones always return what they take—eventually. Lynne Pleau will silence the monster within, whatever it takes. And at Terry Agold's Late Supper, don’t turn around--no matter what. 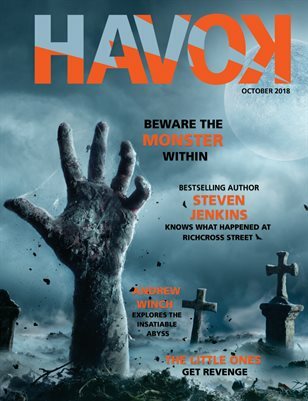 Prepare for spine tingling thrills in the last issue of Havok Magazine!